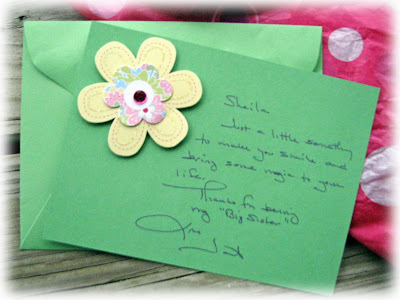 From my Little Bella Sister, Janet.... a Magic Wand.... Isn't it just gorgeous? 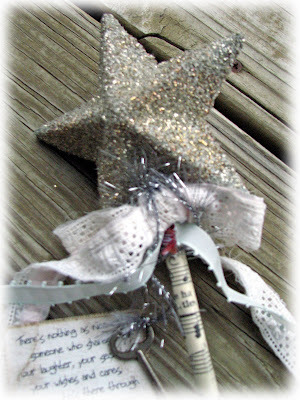 The shiny glitter, lace and ribbon are just so beautiful. Then the sweet friends poem... lovely! Take a moment to visit Janet. Her blog is beautiful and she has a shop as well. Thanks again Janet, I will treasure it always and it now has a home down in my studio so I can look at it each day. Can't wait to meet you at Silver Bella! 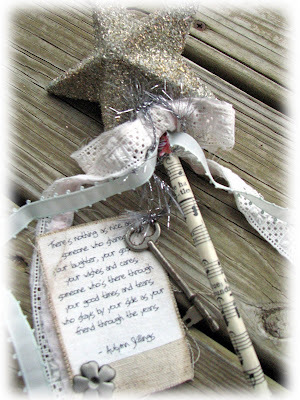 Love your wand...I am hoping to make and sell "Blessing Wands" in my Etsy/Ebay shops. I believe like it says in the Bible, that we are to speak blessings over each other.